The pictured table is made from Pine Plywood. The White Pickling Stain on the sides gives it a Scandinavian look. 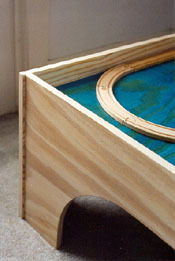 The plywood top is finished with an Analine Dye that makes a cheerful contrast to the lighter wood below. Table can be constructed with optional Built-In Drawers for storage of train pieces (drawers not shown here - see Table Design No. 2 for photos of similar built-in drawers). This table can be made from any wood product that is available in a 4' x 8' sheet. You can upgrade to Birch or Maple plywood, or downgrade to MDF or Melamine. The table can be finished as shown, or with any color of stain or paint that suits your taste. Total cost for the project will depend on what materials, hardware and finishes you choose. Household Iron (not required if edge banding not used).